Unite – not for a party but to work – Can You Relate? I was taken aback by the celebratory reactions to Osama bin Laden’s death. 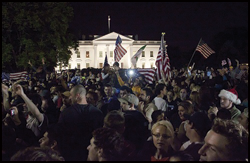 I watched people chanting U-S-A in sportsman spirit and rejoicing outside the White House. Unfortunately, in some parts of the country, messages of hate were directed towards Muslims. While President Obama was clear in his message that bin Laden’s death was not an attack on Islam, post 9/11 government policies on immigration and “counter-terrorism” have had a huge undertone of racism. So were the celebratory chants of vengeance appropriate? Some certainly don’t think so. Nelson Mandela’s release could have caused a backlash for white South Africans. But instead, he urged all South Africans to work together to build a diverse and stronger nation. In Mandela’s words, I found some clarity. Bin Laden’s death does not mean that we return to a pre-9/11 world. What it means is that we need to move past “us vs. them” and work together. We have to unite with men and women alike in the fight for gender equality and relationships without violence. Because uniting to protect each others’ rights does not threaten or diminish our own. Your comments were interesting and gave reason for supporting non-violence. In Zambia, I always knew you as a bright child and am so happy to see you climb to an intellectual level that only select few have the opportunity to reach. I have read some of your works and am amazed at your level of reasoning. I don’t know if your dad reads your comments but he should be very proud of you. I hope you have the very best in future. I too felt a certain sense of regret watching TV celebrations about the death of a human being. However, I didn’t lose a loved one on 9/11. Altough revenge in itself generally seems to result in more death there’s a human element to the celebrations. Too far. Yeah! But, fortunately, or unfortunately, we’re all human. Personally, i don’t want to see the pictures of Osama fleeing for his life. Mandela forgave, but he did not forgive someone for blowing up some 3000 human beings. I wish Mandela were our president. But I feel that Obama did the right thing. Unfortunately, I believe from a purely practical standpoint that Osama could not be allowed to live. Even captured and imprisoned outside of the Middle East, he likely would’ve simply become a living martyr and symbol of American oppression. Essentially, he couldn’t be left alive for similar reasons to why he was buried at sea. Having said that, I completely agree that some of the celebrations went too far. A cathartic release is understandable, especially by those directly effected by Osama’s actions around the world, but not on the scale that was recently seen. Like I stated, I believe he coould not be allowed to live under any circumstances, but that doesn’t mean I revel in his death either. On a slight tangent, it was almost amusing seeing on Facebook all the “We got him” statements as if a bunch of midwest college students were directly responsible for the mission’s success. Really, let’s give credit where credit is due to the men and women in the armed service and intelligence that actually face the reality of day to day war and violence so that we can do things like celebrate in front of the White House and post whatever the heck we want on Facebook. Pingback: Finding meaning in the Sikh killings « Can You Relate?